The month of September was abuzz with activity as New York, Paris, Milan, and London pulled out all the stops at their respective Fashion Weeks. In honor of this prestigious industry event, we present a two-part series focusing on how you can incorporate the hottest 2014 fall fashion trends into your home decorating. Look to the catwalk for a wealth of colors, fabrics, patterns, and accessories that you can use as a source of inspiration for adding style and excitement to your interiors. The shimmer of gold dominated many fall collections during 2014 Fashion Week, making appearances in evening wear as well as in casual tops, shoes, and skirts. Fashion houses, like Chloe and Prada, along with designers Son Jung Wan and Lela Rose, sent a shining statement by using gold tones and designs in their dresses, jackets, and gowns. Gold, and other rich metals such as copper, brass, and bronze, infuses your interiors with fall’s warm, classic hues. Elegant and functional, this pair of golden tassel table lamps is a stylish addition to quiet spaces like bedrooms and home offices. 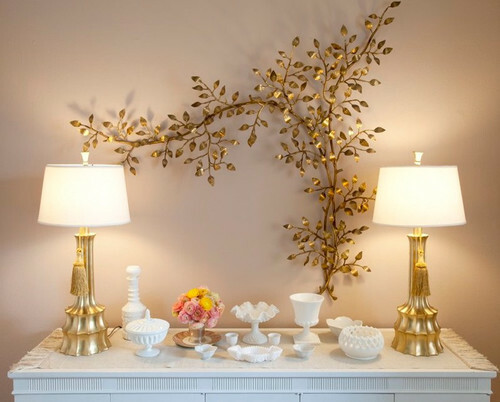 The vintage metalwork branch on the wall displays the splendor of gold in a luxuriously unique and unexpected way. From astrakhan to shearling to brushed alpaca, fur was a winning favorite among many designers, including Salvatore Ferragamo, Tom Ford, Marc Jacobs, and Joseph Altuzarra. Contemporary Kids by San Diego Architects & Building Designers Studio H Design Group, Inc. Embrace this seasonal look by covering your practical home décor with faux fur in neutrals or a variety of colors. These comfy white ottomans work in a playroom but are just as gorgeous featured in a bedroom or home theater room. Borrowing a bit of classic fashion from the boys, renowned brands Chanel, Fendi, and Miu Miu brought on a smart yet fun sensibility with herringbone-inspired ensembles, trench coats, and bags. A more dynamic version of chevron, herringbone is commonly found in the home as tile work on floors and backsplashes. 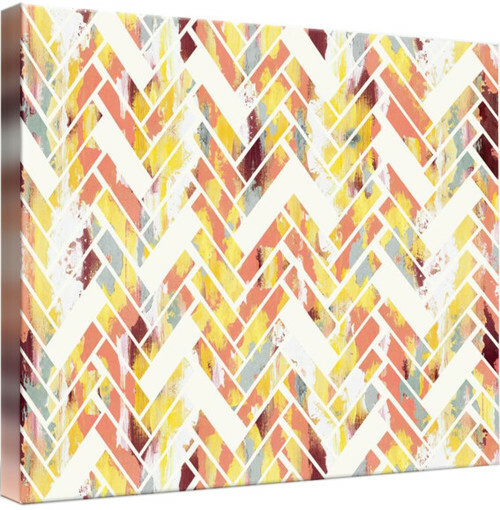 A herringbone canvas print allows you to enjoy this distinctive pattern in smaller doses. Pulsing with vivid fall colors and eye-catching textures, this hand-stretched wall art brings a lot of vitality to a room with a neutral palette. Kenneth Cole, Tibi, and Cushnie et Ochs played up the rustic romance of fall with hats, blanket coats, and bags featuring sleek cowboy motifs. Other designers expanded this trend with pieces exhibiting Native America, Aztec, and Southwestern-inspired colors and prints. Decorating your furnishings with pillows and cushions is an easy way to fulfill your urban fantasy of the Wild West. 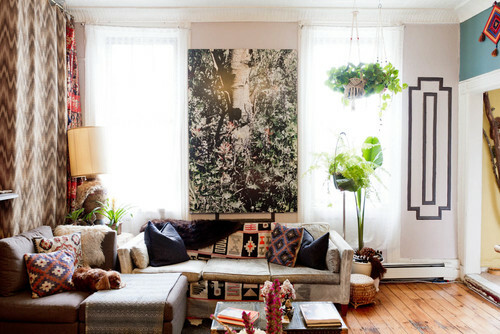 These soft and comfortable sofa accents beautifully complement the other patterned pieces in this eclectic living room. Meet us back here tomorrow as we discuss more trends from Fall Fashion Week 2014 that you can use to enliven your fall decorating.